It's the ultimate fat kid's dream. You get to have McDonald's french fries and you never even have to leave your couch (except to get the door). You don't even have to find your cell phone that's wedged between the couch cushions somewhere. They have a website to order from too. It's scary easy how fat you could get if things got out of control. 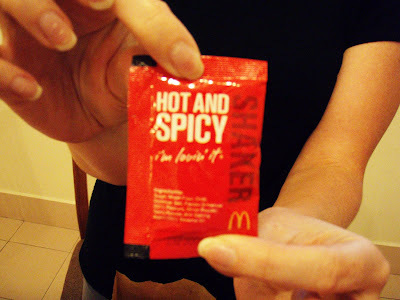 Anyways...To make up for our lack of ambition for a dinner adventure, we decided to try McDonald's special of the moment: Hot and Spicy Shaker fries. McDonald's in Singapore pushes out a promotion every month or so that usually caters to the Asian palate. Shocking! I know. I think the last one was the Prosperity Burger (which I did not try because it looked like a McRib with nasty black pepper sauce on it) and not too long ago, I saw a Wasabi Fish Sandwich with Seaweed Shaker fries (I also did not try this, but Aaron says the fries are really good). This month it's a Double Spicy Chicken sandwich of some sort and these Hot and Spicy fries. We just got the fries because we cannot handle spicy McDonald's sandwiches. I learned this one the hard way when I got a McSpicy Chicken Sandwich last year. I couldn't taste food right for two days. I no longer challenge spicy Asian food. They win. That Wendy's Spicy Chicken Sandwich that made me feel "oh so cool" for eating without a Diet Coke back in Kansas is nothing but kiddie food over here. Ok. Back to the fries. It's somewhat of a process. They bring you a little shaker kit to make the fries into Hot and Spicy fries. I love projects so I was pretty excited. And because I'm a mean wife, I made Aaron wait to eat for ten minutes while he took pictures to document the process. 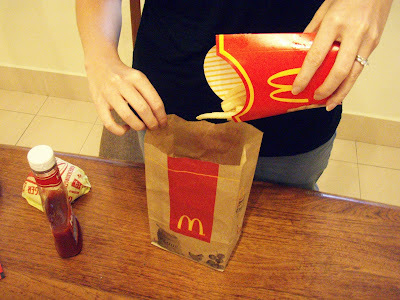 First, they give you a small, folded bag to put your regular fries into. and shake it or tap it over the fries. 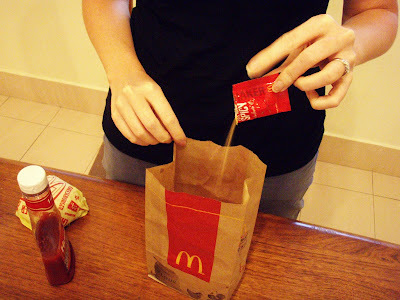 Then you fold up the bag to ensure that it is sealed and no fries will escape the Hot and Spiciness. And then, you shake it like a salt shaker. I really like that part....if you can't tell. 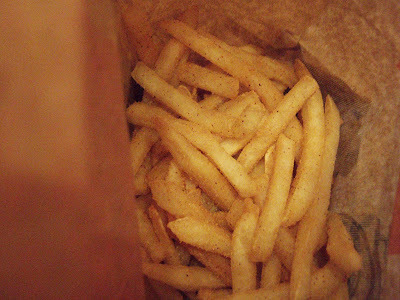 The fries end up with a good coating that's just right. The flavoring tasted a lot like the stuff on Barbeque chips in the States, only spicier. It was really yummy. It was so yummy that I forgot to use ketchup. That never happens. I think a miracle has just occurred, people. You're absolutely right about the Prosperity Burger. I tried it! And it is just a McRib with nasty black pepper sauce. I was disappointed because I was expecting something unique, and it mostly just missed the mark. I was a bit leery of the seaweed fries and refused to try them, but these sound pretty tasty. I came in from Hale Berry's looking for chinese food. 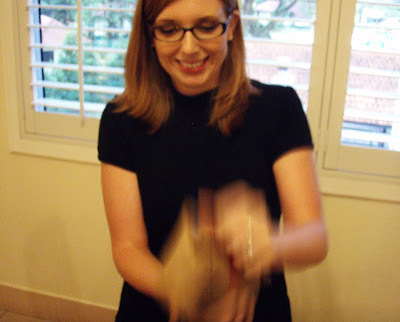 Found out about your pico de gallo and followed the instructions to a T. Fabolous! Ok now i feel like some McDs. Lol. 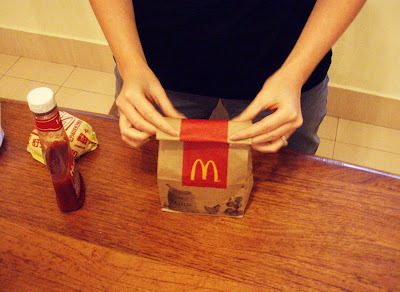 Hi I chanced upon your blog and I absolutely love it =) I'm a Singaporean and I cnt really take the McSpicy too but I cnt help it! I LOVE IT! =P Usually just have loads of water nxt to me..but I think that's how a lot of singaporeans enjoy their food. They like spiciness so much that they don't care how much their noses are leaking and how much they're sweating later.. I'm a mcspicy freak! I'm so addicted to it and I just ordered one lol. Tip if its too spicy just get the mcflurry to cool down after that.